Stars And Garters: I Said It Once Before, But It Bears Repeating! Stop me if you've heard this one before. Especially the ladies. 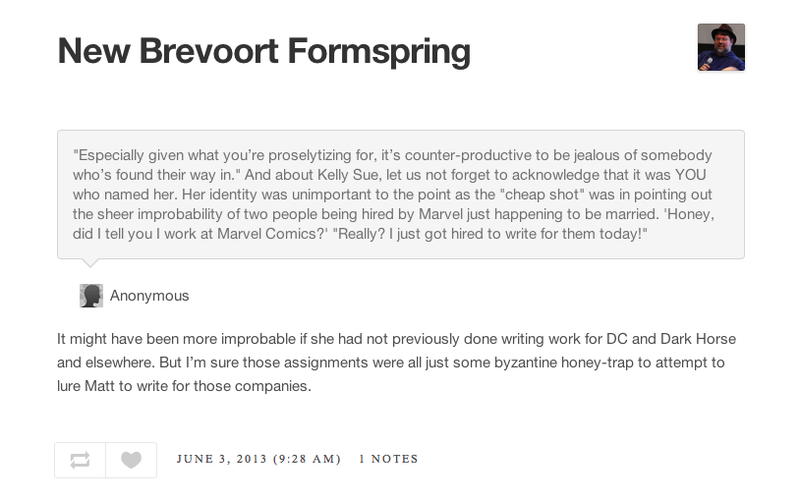 Kudos to Brevoort for the sarcastic comeback. It would be funnier except odds are somebody actually believes that. There's also been memes like this. Kelly Sue DeConnick doesn't need my help defending herself against crap like this. She's already done so quite nicely here. And so have her fellow professionals like Neil Gaiman here. They and folks like fellow blogger Thom Wade have already said what needed to be said more eloquently than I ever could. So why add my two cents? Because the more people speaking out and calling out this garbage, the better. I have to confess that my DeConnick knowledge is limited. I'd never read any of her work prior to the summer of 2011, and from there I've only read two series stints with her work: a 3-issue Supergirl fill-in just prior to the Nu52 reboot and the current Captain Marvel run. So I'm not a die-hard Kelly Sue fanatic who's written everything she's ever published professionally. But I can attest, judging by the stuff I have read, that she definitely did NOT make it big by shagging anybody. Yes, this IS Dakota North looking like she's wearing a GOATEE. If there's any comic that works purely because of its writing, it's that comic. That's all on Kelly Sue. I shouldn't have even had to say all that, though. And if it were DeConnick's husband Matt Fraction instead of her, I can damn well guarantee I wouldn't have had to. Because the accusation would never have been leveled. Seriously, accusing a female professional of needing to use sexual favors to get ahead in her job? Did that line I wrote immediately above seem...familiar? Like perhaps I'd written it before? Sadly, that's because I HAVE. Yeah, I know it's not my most original comeback. But that's nowhere near as old and tired and hackneyed as people constantly assuming successful women just banged their way to the top. And if it's old and tiresome and infuriating to me, imagine what reading that must be like for the women on the receiving end of that sexist accusation. Unfortunately, the braindead dolts who come up with this sort of crap never ever get any new material...because it is probably beyond their limited understanding. A woman achieving success on her own? Unthinkable!